Possible Heart Benefits Of Taking Estrogen Get Another Look : Shots - Health News Evidence has ping-ponged over the decades on the effects of hormone therapy on a woman's arteries. The latest study suggests a brief stint on hormones might be helpful — if given at the right time. 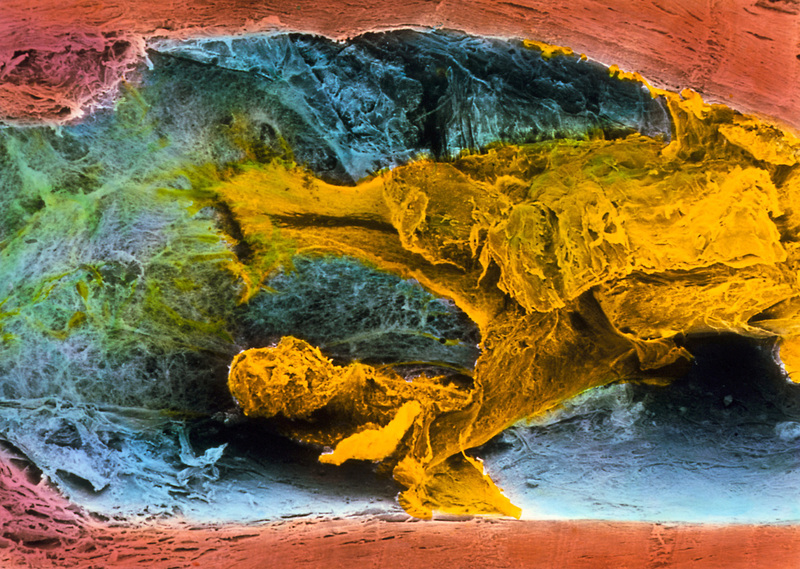 Fatty plaque (shown here in yellow) blocks about 60 percent of this coronary artery's width. The increasing thickness of artery walls is just one factor that can increase vulnerability to a heart attack or stroke. In the 1980s and '90s, many doctors told women going through menopause that they should take female hormones — estrogen and progestin — to alleviate symptoms like hot flashes and sleep problems. The hormone therapy was thought to have other benefits, too, like preventing broken bones, colon cancer and heart attacks. But in 2002, a bombshell hit. The Women's Health Initiative, a long-term health study with thousands of participants, showed that not only did the hormone therapy not ease those serious health problems but likely did some harm — putting women at a higher risk of heart disease, stroke and breast cancer. "It's scary," says Dr. Howard Hodis, a cardiologist and professor of preventive medicine at the University of Southern California. "No woman wants breast cancer. No human wants cancer." After that, the pendulum swung away from using hormone therapy for anything more than alleviating menopausal symptoms in the short term. And as millions of women stopped taking hormone replacement therapy, the breast cancer rate in the U.S. dropped. Still, ever since, researchers like Hodis have wondered whether a short stint on the hormones could help protect some women's hearts, especially if they started the treatment early enough. So he and his colleagues launched a study, published Wednesday in the New England Journal of Medicine, involving more than 600 healthy, postmenopausal women who had no evidence of heart disease. Unlike in past studies, these researchers directly tested the effect of starting hormone therapy within the first six years after menopause, versus the effect of starting 10 years or more after menopause. The women stayed on their treatments for five years, and the scientists checked in twice a year to measure with ultrasound how much the walls of the women's coronary arteries had thickened. That sort of thickening is one predictor of heart disease and stroke. The results? Women who started hormones within six years of menopause had artery walls that thickened a little more slowly than the women on the placebo, whereas the extra estrogen did not seem to slow thickening in the group that started the hormone therapy later. "That's biologically a really interesting observation because it suggests that beneficial effects of estrogen on atherosclerosis may depend on timing," says Dr. Caren Solomon, a women's health specialist at Brigham and Women's Hospital in Boston. The findings dovetail with a 2012 study of 1,000 Danish women, which found that those who received about 10 years of hormone therapy (starting within a year of menopause) had a lower risk of premature death, heart failure and heart attack and did not experience a higher risk of cancer, blood clots or stroke. And both of these clinical studies square with recent research in mice and rats suggesting that estrogen can help keep blood vessels healthy, but only if there are receptors in the vessel lining to take it up. As female rodents age — or are deprived of estrogen — those receptors stop working. Something similar could be happening in women, Hodis says. The hypothesis he and others are continuing to test is that hormone therapy might prevent the women's arteries from getting clogged — like keeping pipes from getting rusty, he says. "If you have clean vessels, let's say, and you start hormone therapy, you can slow down and somewhat prevent the accumulation of rust — the hardening of the arteries," says Hodis. "But if you start [with] somebody who's already got rusty pipes and put them on therapy, it doesn't do much." The next step, he says, is to figure out what's actually changing inside women's blood vessels as circulating estrogen plummets. But at this point, says Solomon, the clinical implications of Hodis' study are unclear. For one thing, artery thickness is just one of many, imperfect ways to predict who will have a heart attack or stroke, Solomon points out in an editorial accompanying the study. Other factors contribute, too, and a study would need to be a lot bigger and follow women for a lot longer to serve as the basis of practical advice to patients. So, she says, the current recommendations of physician groups like the American Congress of Obstetricians and Gynecologists still hold — to use hormone treatments only in the short term, and only to manage the symptoms of menopause. Not as a method of preventing heart disease.